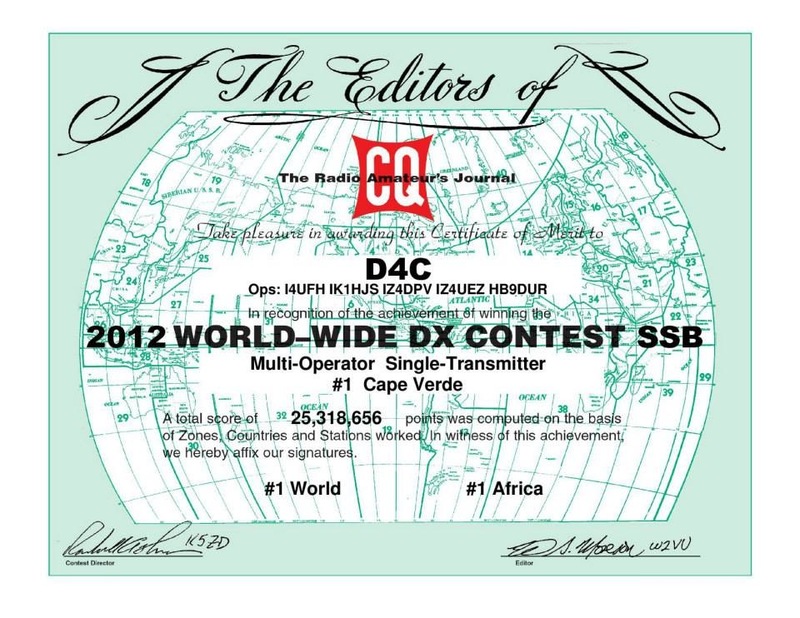 My first Guest-op experience form the D4C station was during the CQ WW SSB 2012 contest. What a blast! I am in trouble finding the word describing the level of adrenaline in my body while operating for the first time this unique station! Our team performed the best score in the M/S section, winning this contest. How this all started? 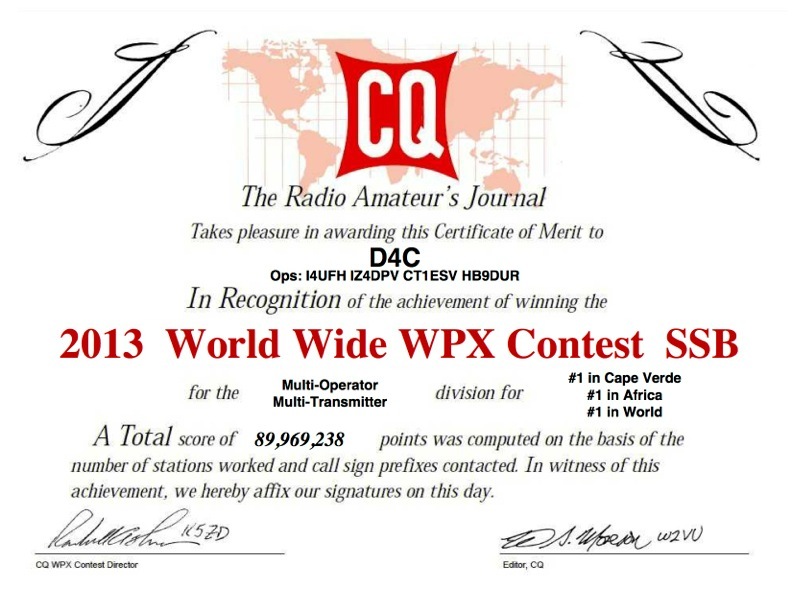 Based on the previous experience, I have been contacted by the SSB team Leader I4UFH Fabio who was putting together a bunch of OM to participate into this contest. Actually, my answer was something like: “No Fabio Thanks! I have booked plenty of time for the next big project in October 2013 and this time I cannot make it. You know, it’s going to be during Easter time.” Then it was CTU Italy time and just before heading home, Fabio insisted again and persuaded me to be part of the event with a “last minute” opportunity. I could leave the site without saying YES ! Email were obviously exchanged for the preparation which was mostly carried out by Fabio by building hardware and his “Magic boxes” to run the M/S category in full respect of the current rules. Lesson one learned to and from Cape Verde: Plan enough travel time. Sometimes, you lose your flight because the transit times planned by airlines are not enough This time was no exception. The flight from Milan took-off late, and I lost my coincidence to Praia. No problem; overnight in Lisbon and new ticket the following morning directly to Mindelo /Sao Vicente. Great! instead of arriving Friday night at 21:00 just to start the contest in a “full Guest-op style”, this aircraft would have arrived at 12:00 letting me contribute in the station setup. Anyway, on the way to Monteverde I felt an extraordinary joy by looking at the magnificent view from the road over the ocean and it was like I left this site just a few days ago. Most of the preparation job was thoroughfully done hours before the contest start and ready to run it in M/S. Unfamiliar situation compared to the usual last minute ready to go ! However, after a colourful discussion regarding how boring could have be this category, the decision was made !. Check of cross band interference and if acceptable, setup change and sign in a Multi –Multi category. Great ! but we were just 4 operators and 3 station to manage and still pretending to reach a decent results with the top target set to : Have fun . Yes it was fun and the Record was building up – I started on lower bands and I kept going on all night long. I could not believe my eyes when I read after a few hours an 11 Mio pts on the screen. I opened the 10 m to CT1ESV and took my first break after. I had to fight with my body to reach the next night in good conditions, but the second one went smooth. Well, in the end of the event, I realized that I slept 5 hrs out of 48hrs of contest. This is the final result for our M/M entry setting up an ALL TIME SCORE and RECORD for Worked Multipliers! Leaving Monteverde is always a sad experience. Packing stuff, making sure that all is safe and again, I went through the same experience of missing coincidences, postponing business dates, because the incoming aircraft was late, but compared to what I was bringing home in term of friendship and Ham experience and on top of it the Enormous results I quickly forgot the discomfort. My wish is to work your station again from this superb location during on of the forthcoming event!